For our ACG Fall Fund Drive, we’re sharing stories on our Changing Lives Storyboard of ways music has changed our world, and how our community helped make it happen. 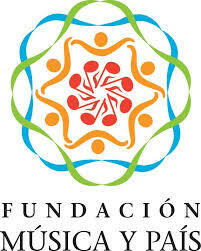 Consider supporting ACG today! We’ve been talking to teachers around the country – and the world – about how they use our curriculum. 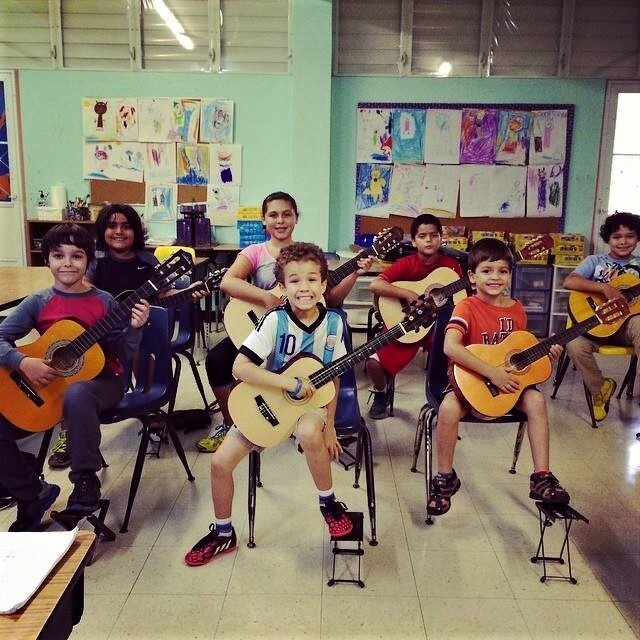 The following is a spotlight on Héctor Vázquez, a guitar teacher in Puerto Rico. Héctor Vázquez was working on his Bachelor’s in Guitar Performance when he became a Teaching Assistant. Although performance had always been his focus, he began to notice that teaching was improving his own guitar skills. This led him to the realization that to be a good player, you must know how to teach. He started his Master’s in Tallahassee, where he expanded his teaching experience by doing private lessons, leading a full studio, and directing a seminar. 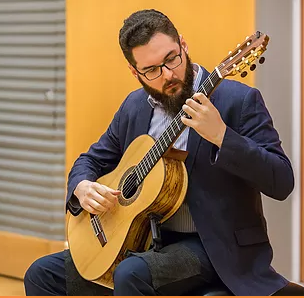 After completing his degree at a school back in Puerto Rico, he began to work at the Fundacion Musica Y Pais, and eventually led the guitar orchestra in his local conservatory. “We were only in two schools at the beginning, and none of the students had their own guitars – they had to borrow them,” Héctor recalls. They gradually expanded their reach, and now the program supports over 1,300 students in 20 projects located throughout Puerto Rico. Héctor believes his role is to help students progress smoothly and quickly. He works with guitarists between the ages of 8-60, and is grateful they all appreciate the thought he puts into instruction. As he began to teach in more group settings, Héctor was frustrated by a lack of resources for guitar educators. He thought that a straightforward, effective progression for classroom guitar education did not exist. He began to research a good method for ensemble use. In the fall of 2017, Héctor subscribed to GuitarCurriculum.com and planned to start using it with his students. 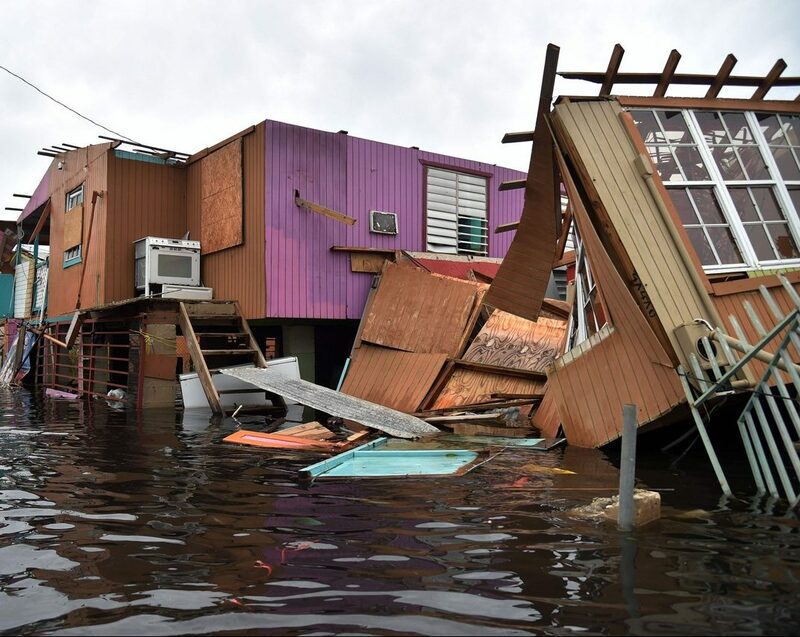 As a Category 4 Hurricane, it was the worst natural disaster to affect Puerto Rico on record. Most of the island’s infrastructure was destroyed, the vegetation was obliterated, and much of the population was faced with a humanitarian crisis due to flooding and lack of resources. The storm wiped out the entire island’s power grid, causing millions to lose electricity. Almost 3,000 people were killed. Luckily, Héctor’s community survived largely unscathed. Once the power was restored, Héctor was able to fully embrace all the resources in GuitarCurriculum.com. It was January, and his students were almost a semester behind. This fall, he began the Curriculum with his new students from the very beginning. He says it’s working very well. One of Héctor’s guitar classes performing with a handbell choir as part of the ‘Musica para Todos’ initiative.